The Greater Norwich Area Chamber of Commerce is the voice of business in the Northern New London County. GNACC proudly represents Bozrah; Franklin; Griswold; Ledyard; Lisbon; Montville; Norwich; Preston; Salem; Sprague; and Voluntown. DRIVE CHANGE: ENGAGE YOUR LEGISLATOR: What do you envision for Connecticut? What are your concerns? What questions do you want answered? No matter your needs, we'll put you in touch directly with a state legislator. 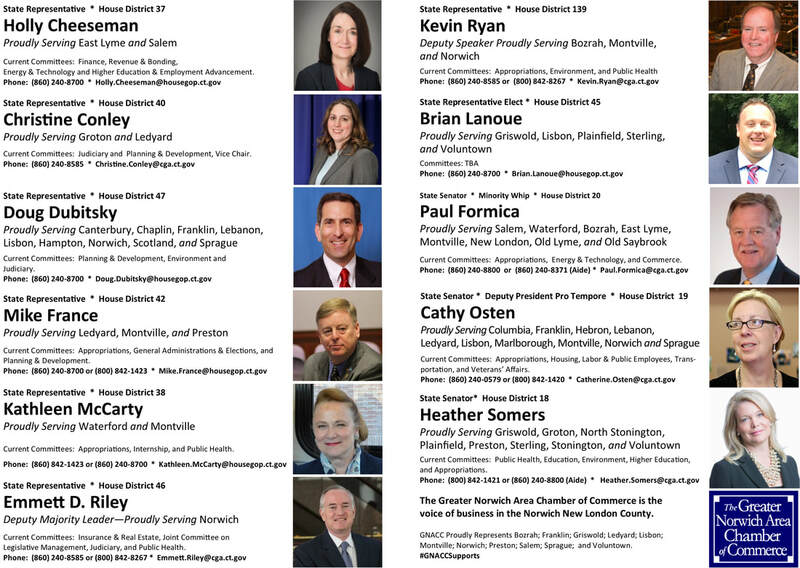 CLICK HERE to find contact information and resources for members of the Connecticut House and Senate. Search by town, name, or legislative committee. You may also select all legislators, all House members, or all Senators.